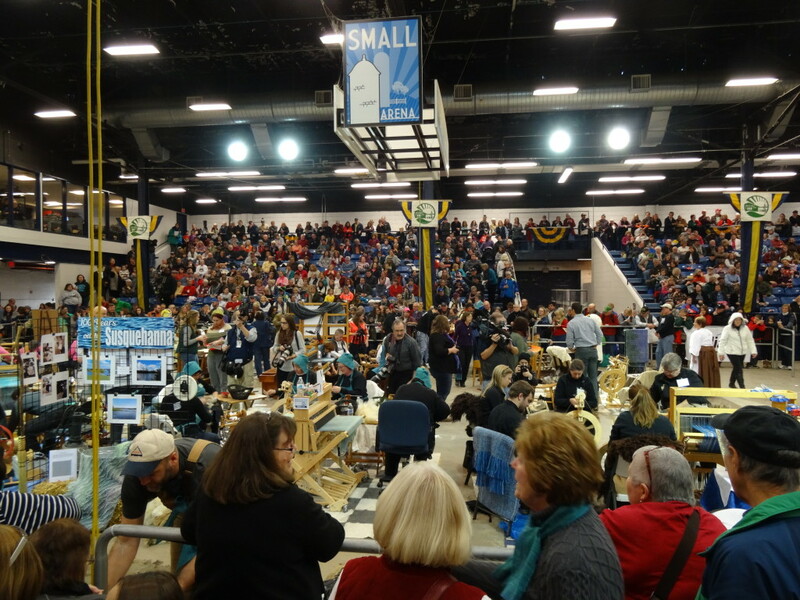 On January 13th, I made the cold trek to the PA Farm Show in order to catch this year’s Fleece-to-Shawl (Youth) and Sheep-to-Shawl competitions. 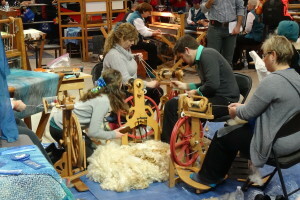 Each team is composed of a shearer (for the Sheep-to-Shawl competition), three spinners, a carder, and a weaver. 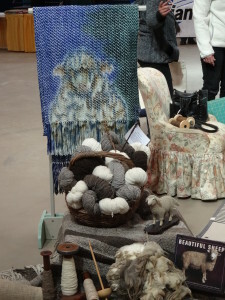 The teams start with a sheep (or a fleece in the case of the youth competition). The fleece is carded and spun. 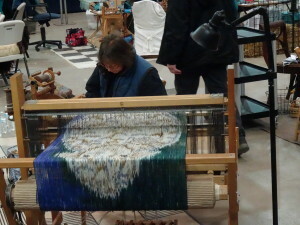 The weaver, who has a warped loom at the ready, then weaves the yarn as weft into a previously designed warp. Finished sample shawls are on view so attendees can see what the team is making. 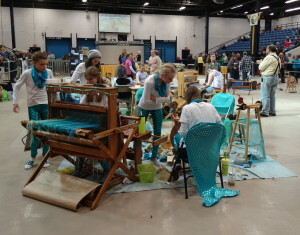 The Fibering Five compete in the Youth Fleece-to-Shawl competition with an ocean theme. Teams start at the same time, since part of the judging is on speed. However, speed is only so important. 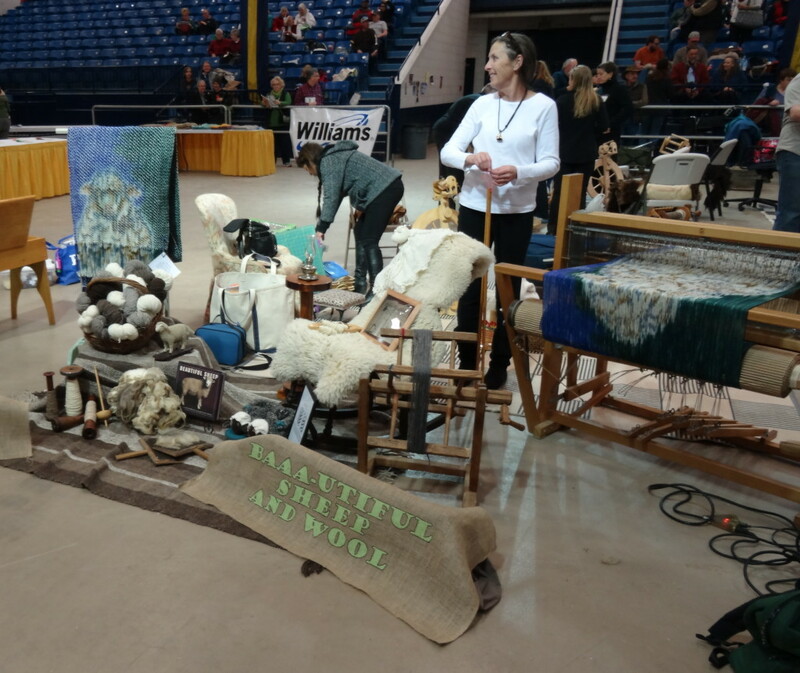 Every aspect of the process is submitted for judging, including the shearing, the quality of the selected fleece, spinning, weaving, and shawl design. Shawls must measure at least 22” wide by 78” long to qualify. 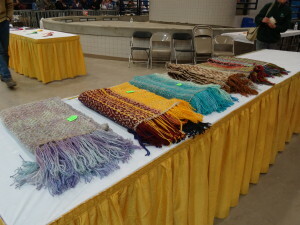 The Youth Fleece to Shawl event began at 10 AM and ended at 1:00. The adults began at 3 PM and ended at 5:30. 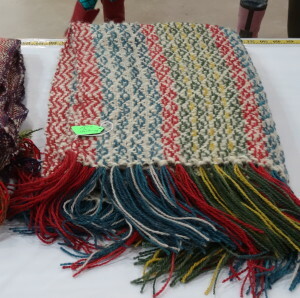 At 6:30, shawls from both contests were auctioned off to the highest bidder. 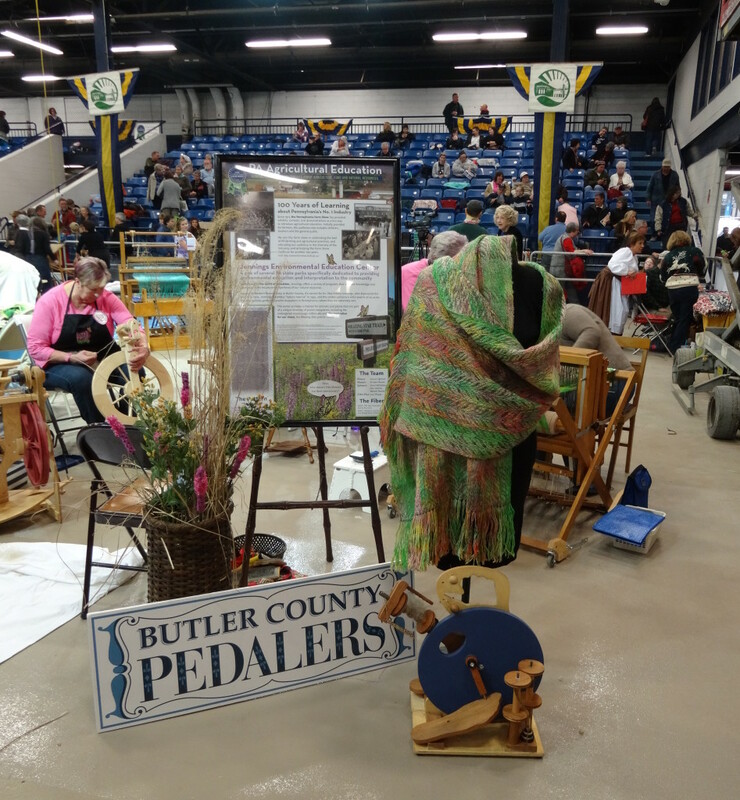 Sheep-to-Shawl competitor Butler County Pedalers sets up to make “The Blazing Star” shawl, based on a local flower species. Friends Thru Fiber, of Franklin County, getting ready to make an interesting shawl using a handpainted warp paying tribute to the sheep that make all of this possible. I really fell in love with the cute face on this shawl! Friends Thru Fiber weaver Michelle Lushbaugh and the painted warp. 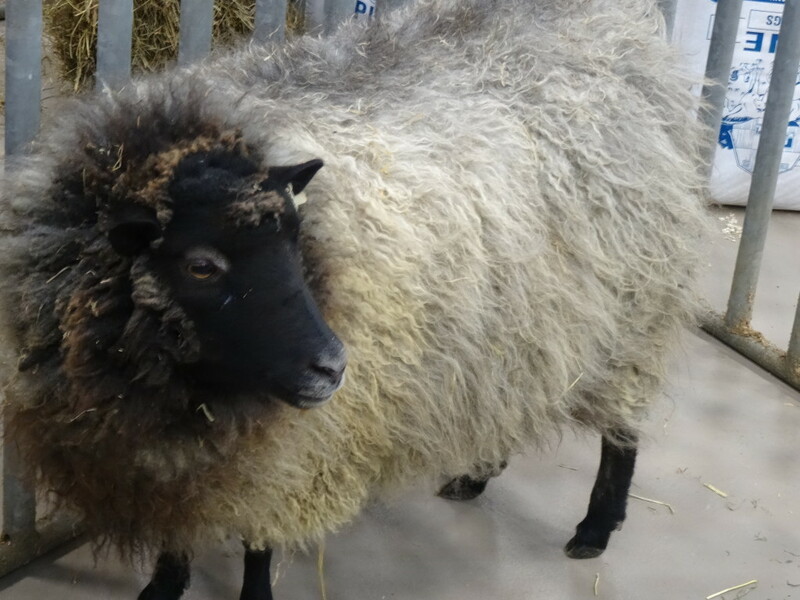 A sheep waiting to be sheared at the start of the Sheep-to-Shawl competition. 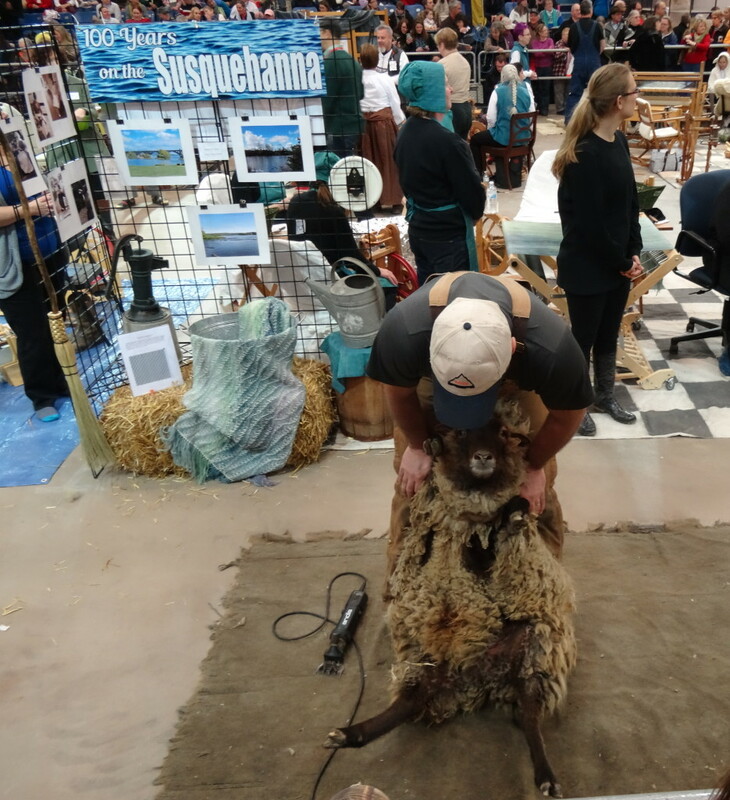 One of the shearers was using a hand-cranked set of power shears. Most used electric shears. 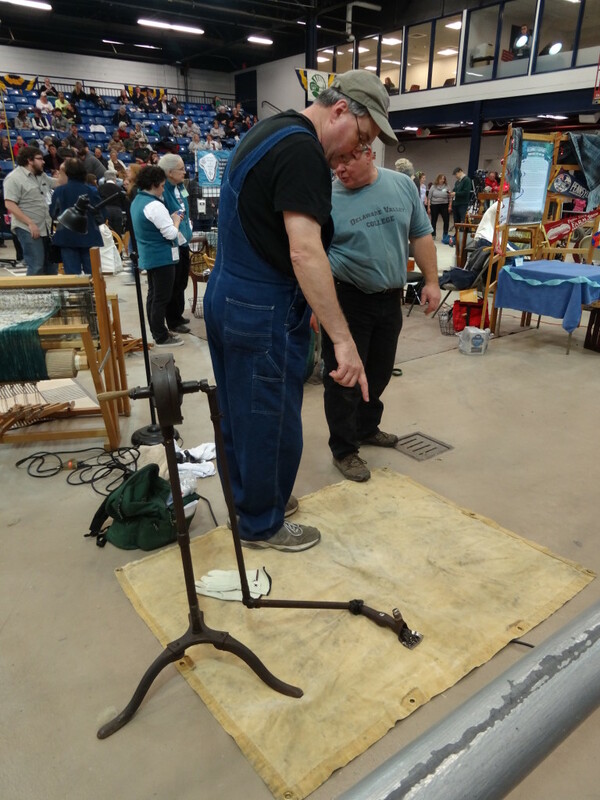 Nathan Good, of the Lancaster Spinners & Weavers Guild, prepares to shear Warren, a Shetland sheep, as soon as the contest officially begins. 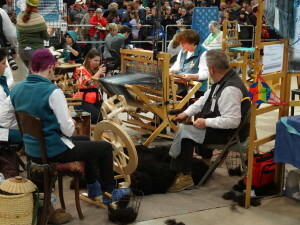 Teams hard at work during the Sheep-to-Shawl competition. Sheep-to-Shawl: Team ‘Time Warp’, from Montour County, with their undulating herringbone starburst pattern shawl. 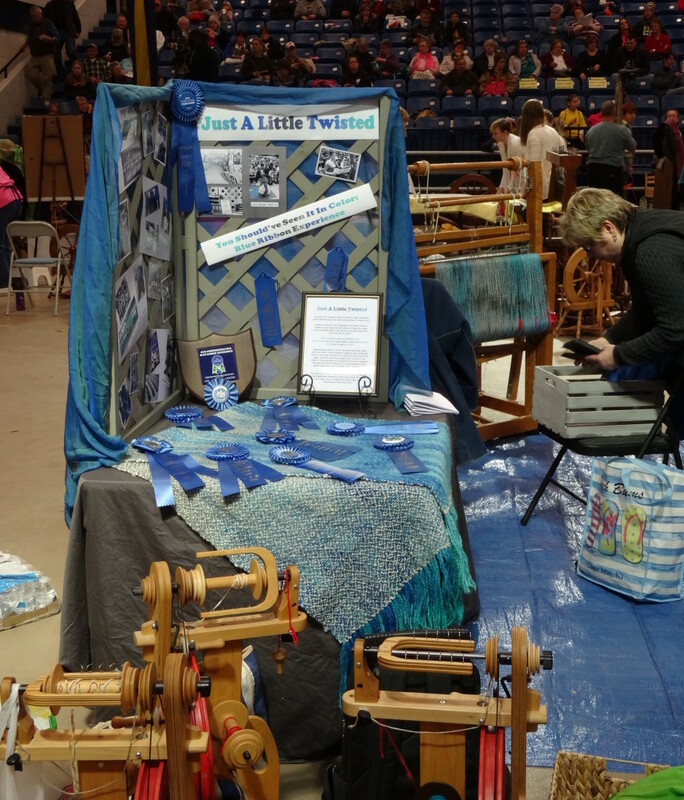 Members include Carl Geissinger (shearer), Libby Beiler (weaver), Emily Kephart, Ivy Allgeier, Katherine Dashner (spinners), and Jeff Johnstonbaugh (carder). Fleece-to-Shawl: Team ‘Wizards of Wool’, from Adams County, with their brightly colored entry “Farm Tractors”. Members include Joshua Stoner (weaver), Marissa Shoemaker, Jacob Stoner, Dorothy Marquet (spinners), Cate Kidwell (carder), and Meredith Singleton (alternate). The winning shawl, “Farm Tractors”. I happened to run into Joshua and Jacob Stoner, weaver and spinner, respectively, of the winning youth team Wizards of Wool. They and their (justifiably) proud parents were waiting for the adult competition to begin so they could see the shearing that takes place at the beginning of that contest. 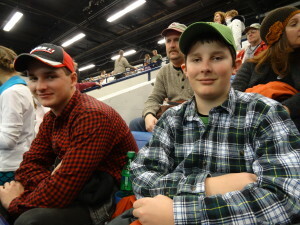 Congratulations, Joshua and Jacob, and to the other youth competitors! You all did a great job! Joahua (left) and Jacob (right) Stoner of Wizards of Wool, 1st place winners of the Fleece-to-Shawl competition.